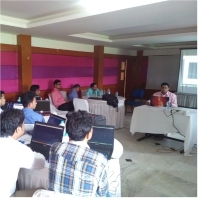 Training of Trainers (ToT) is a program for the development of training delivery skills of those who wish to become trainers in the sector of their preference and aligns them with the National Skill Qualification Framework (NSQF) anchored at NSDA under the leadership of Ministry of Skill Development and Entrepreneurship (MSDE), Govt. of India. The primary objective of TOT program is to introduce the trainers to the changing space of training in the country. With the setting up of Sector Skill Councils and advent of National Occupational Standards (NOS) for various job roles across sectors, it is important for the existing and aspiring trainers to be up-to-date with all these developments. A trainer can deliver great results only when he/she understands the basics and is able to cater to needs of the learners. Under PMKVY and other schemes, it is mandatory to be certified by the SSCs under the ToT. ToT for an Existing Trainer. The ‘ToT model for a new trainer’ entails the training of domain QP and platform skills along with the assessment on both within a period of 10 days, given that the trainer already meets the criteria set by SSCs on educational qualification and industry experience. On passing both the assessments with a minimum score of 80%, the trainer becomes a ‘Certified Trainer’. The ‘ToT model for an existing trainer’ is the ToT model applicable for Trainers with prior training experience, minimum 500 hours. The ToT entails only the assessment and not the training on domain QP and platform skills assessment given that the trainer already meets the criteria set for the educational qualification and industry experience and has a minimum training experience of 500 hours. On passing both the assessments with a minimum score of 80%, the trainer becomes a ‘Certified Trainer’. Any mark below 80% would require the trainer to enroll for the ‘ToT model for new trainer’ if he/she wishes to. 1)	For domain skills training (2 days for the training and 1 day for assessment). 2)	Platform skills training ( 6 days for the training and 1 day for assessment). To become a ‘Certified Trainer’ the trainer needs to clear both the assessments (domain and platform) with at least 80% marks. The certificate will be issued to the trainers will be valid for 2 years. How the trainers can enroll for the TOT? The trainers need to register in NSDC Takshashila Portal and has to raise request for the ongoing Training Program according to the SSC Training Calendar. Also the Trainers can contact us on – info@mescindia.org & operations@mescindia.org for any information related to TOT. The trainer will be required to submit the following documents at the time of registration : Documents supporting your highest educational qualification, class 10th and 12th class certificates, Aadhaar card, any other identity proof, work certificates for relevant industry experience and work certificate for training experience. The training request will be approved by the SSC on the basis of the eligibility criteria.